Note: Proximity aggro is a major factor in this mission. Please be aware that you can aggro a neutral group by just moving into its aggro bubble. Drones can be deployed as per normal as long as the conditions are met. See Aggro Notes. At warp-in, you will see Group 4. Four other groups will spawn several seconds later. The spawn order is Group 2, Group 1, Group 3 and finally Group 5. It is recommended that you DO NOT MOVE your ship. The proximity aggro bubble for Group 4 is about 80km and you may get aggroed EITHER during warp-in or if you move towards it. Group 1 will auto-aggro immediately. Groups 2, 3, 4 & 5 will remain neutral until attacked or aggroed via proximity. The two Loyal elite frigates in Group 1 will frequently warp scramble you in under 20 secs. Attacking Group 1 does not aggro any other groups. You can safely deploy drones to attack this group. Attacking Group 2 aggros Group 3 (and vice versa). You can safely deploy drones after the pair have been aggroed. Attacking Group 4 aggros Group 5 (attacking Group 5 didn't aggro group 4). You can safely deploy drones after the pair have been aggroed. Group 4 may aggro drones if they get too close to that group. Throw off aggro from Group 5 : Wait until an enemy ship from Group 5 have locked your ship. Warp out, then warp back in. No longer needed, doesn't auto-aggro. Be absolutely careful not to move towards the neutral groups. Move away from them to minimize setting off the proximity aggro. Recommended order of elimination : Group 1, Group 5 (if you do not warp out to throw-off aggro) & Group 4, finally Group 2 & Group 3. Mission is flagged completed when ALL ships in Group 5 are killed. Warp in, kill (or ignore) Group 1. Eliminate all ships from Group 5 and warp out. For me this was Heavy Thermal and EM damage from all, and using EM did the most damage. YMMV, but for me drone-aggro is not automatic : I routinely release my drones in this mission, and they only draw aggro if they get too close from an un-aggroed Sansha ship (inside 20 kms IIRC). As long as you watch them closely, they should be safe to use. Sava Lords don't deal any Kinetic damage anymore. The room can be full agroed, in an abaddon Two Em hardeners t2, Two Thermic hardeners T2 , one EANM t2 and a faction Large armor repairer, but only if your DPS is sufficient to kill all rats before they come to their optimal. according to me, the full agro DPS is more or less 1500dps with about 60% Em and 40% Thermal. -- I just blasted the crap out of the battleships with multis and scorch till they were all dead, then started shooting at the ones that weren't aggro yet. My drones worked their way through all the non-BSs while I was killing the BS's. I actually popped the last battleship right as they popped the last cruiser. Was kinda cool! -- I kept both LARs running the whole time, but my armor never did more than wiggle, and I popped the BS's really fast. Takes the BS's a long time to get into their optimal, it's a pretty easy tank if your DPS is on the big damage dealers. Could not have done this without the guide. Followed advice on initial warp in and did not move. Engaged Savage Lord with Thunderbolt HM and somehow pulled aggro from another two groups. True to the scouting report I was soon scrammed and webbed but 5 x hobgoblin I's made quick work of the two Centi Loyal ships doing the webbing. Brought the drones back in and knocked off some smaller ships before having to warp out due to having three groups aggro'd which was too much for my passive tank. Upon return, only group 1 was aggro'd and was soon dispatched. Next engaged groups 2 and 3 and again deployed 5 x Hobgoblin I's to dispatch the frigates. After that I just knocked off ship after ship using Thunderbolt HM''s until last of these groups were dead. The remnants of 4 and the whole of 5 were easily tanked and dispatched as fast as my DPS would allow. 12 of 35 wrecks were empty (mostly smaller ships) but salvage as a whole was only average in value with 28 armor plates being the highlight. The total salvage took up 2,240 M3 of space. Several smallish Veld asteroids in the 70,000 M3 range were spotted but none were clustered close enough to make post mission mining viable. Yes it took awhile due to low DPS of my Drake, but that gave me time to type this. I completed this in a Golem, T2 EM/Thermal hards, T2 Siege Launchers with Navy XL Shield Booster and Dread Guristas Shield Boost Amp. Used Navy Mjolnir for the under 30km BSes, Mjolnir Javelin to pick off Group 5 and others as they hit Javelin range. Piece of cake, just be wary of scrammers and you're fine if you follow the guide. Made about 25mil ISK total between a friend and myself through bounty, loot & salvage. This mission is worth doing. Completed in a Raven w/ Cruise Missiles (tanking) and a Rokh (dps). Completed Stabber Fleet Issue. Great fun. Would be a good mission for a group of Attack Frigates. I take out scrambers/webbers simply by charging straight at them, kicking in guns at falloff; they die quickly. I'm conservative with my drones (3 med/2 sm) and use them primarily for battleship dps. Suggest you keep your log open to check for optimal orbit/speed/track distances and damage sources. Approach groups at a tangent if dps starts to climb. Be aware that you will find orbit obstacles near some ships. Impossible for beginners without other players helping. You can safely kill group 1 (drop group 5 aggro!). As soon as you try to kill group 5 (or 2) you will automatically aggro group 4 (3 respective). The first match will be OK since they are not in turret optimal range. Maybe you'll be able to kill like 2 battleships and the 2 BC before your cap runs out. Now comes the problem... since this is a deadspace mission you can only warp in to the same place everytime and now that you are back group 4 and 5 (2 and 3 respective) will be VERY near and immediately do incredibly high damage to you, no matter how well your tank is. Remember there are still like 7 battleships and several other nasties in these groups. No way to deal with them, damage taken will be enough to make you flee before a single ship is destroyed. I wonder how anyone around 2.2 mio SP is supposed to finish this mission solo. Up is a great direction, use it. As with many missions, your experience of it will depend hugely on tactics. I've enjoyed it (see above comment) playing aggressively with a Stabber Fleet--once the web/scram frigates are out of the way, you're unstoppable. In a Pulse Apoc with Scorch, decent AB, and a tracking computer with range script, if you start by heading straight up with your AB on, then staying at sniping range, you'll take so little damage you could get by with a small armor repper and no drones (one-shotted frigates with mega pulses at adequate range). So? Have fun. Play around. The Beast/Plague Lords use Tracking Disruptors, although not very often. Confirmed in 3 run throughs. Small and medium T2 drones. Not much trouble. A somewhat easy mission with the right tools. Read the guide. Flew a T2 fitted Rokh. Pocket 1: Normal if u manage the agro. done in a passive tanked rattlesnake (2x invuls) using senty drones. not a good ship for the job due to low natural EM resist. not dangerous but probably should not aggro the whole pocket at once. warp in. sit still. kill the scramblers with light drones. then use sentries to take out group 5. other groups did not aggro. Done in a Megathron navy issue..
Got to 20%armor hp(agroed group 1,4,5), but then started rising.. Did mostly thermal and kinetic damage(rails), not a hard mission, a quick one. Had no need to kill the scramblers, just focused on the battleships. This was a tough mission, I had to warp out twice in my Raven. Bought a Navy Raven and went back to finish it. I didn't aggro any groups other than the ones that automatically shot at me. The following fit is what I used on both ships, except the Navy Raven has another Cruise Missile Launcher. Also, I checked various combinations of the shield hardeners in EFT with the Sansha profile and 2 EM and 2 Therm was the best. Easy Peasy in a Sentry Dominix. Completed in Abaddon, very easy mission with good salvage. after kill BSs,if cruiser stay too close,DONT SEND DRONE attack it,or they will aggro group 4.i had warp out once because my drone aggro it. Complete in 58 minute with a passive Drake. 1. Wait for all groups to spawn. 2. Defend from group 1 auto-aggro while waiting for Group 5 to auto-aggro. 3. Warp away to drop Group 5 aggro. 4. Return to destroy group 1. 5. Destroy group 2, then group 3, then group 5, then group 4. Elapsed time: 57 minutes. Thunderbolt Heavy missiles launched: ~1800. Very doable mission for properly fitted Drake. My drake has about 318DPS tank against sansha's and I still felt overtanked during this mission. Shield never dropped below ~65%. Most damage is received during the initial attack of group 1 and 5. I used AB to keep distance from group 5 while I killed group 1. Other groups can then be attacked independently. Recommend fitting for maximum gank if you have the balls otherwise it will take a long time to kill all the BS. I used 3x CN BCS and 7x CN HML with standard thunderbolt missiles. Group 4 did not aggro until I started to shoot the final Battleship in Group 5. I suspect this is a specific ship, unfortunately I didn't realise and check which one, because they aggro'd my drones and not me. The Sanshas Plague Lord BS's Tracking Disrupt. Submitted screenshot to identify which group is which. I just agro'd everything with the rail then set hobs on the little stuff. Once frigs are down ogres can clean up while you loot/salvage. Took me a little over half an hour. very easy mission to do semi-afk in a well tanked T3 or faction BS. i semi-afked it in a tengu with simple t2 fit. Mopped em up in 20 mins (accept to turn in) in a full-T2 Navy Apoc w/ Scorch. I warped out to break group 5 aggro, then returned, killed group 1, then kited group 4 & 5 up & away (thanks JackUnderhill). Hardly had to use shield booster. One group 5 BS did not follow. Warped out & back to get close, finished group 5, attacked group 2 (having not moved this warp-in). Group 3 did *not* aggro with group 2. Really not hard doing it this way. Forgot to mention that I flew to max targetting range before starting the kite, nothing got within 40km while kiting, except for missiles the sanshas were basically missing the whole time. Lately after I finish group #1 then target #5 at 90k (not shooting), group #4 will agro me instead. It keeps the incoming DPS way down. Then I mop up #5, then #2, then #3. Just finished this mission in Abaddon with only AWU 3 so my fit isn't optimal. Took 19 minutes to complete easy as pie. Warped in, took out cruisers Group 1, Drones on Frigs, and then laid waste to BS using Imperial Multi. Group 5 still 75km+ so switched to Imperial Stand and melted them (switched to Imperial Xray when within 60km). Group 4 was 85km off and melted them before they got to 70km. Targeted and killed cruisers and destroyers in group 2/3, drones after frigs and then melted the BS. Closest they got was 47km. I warped in, didn't move, tanked the killed the 2 groups that aggro'd, and got Mission Complete. The remaining 3 groups each pulled separately (contrary to what it says above); I was careful not to send in drones until they got a bit closer to me. Very easy; worst part was the 2 groups in the beginning. (I have 2mil SP in an Apoc). Finished in passive tanked, T2 fitted Drake. No big deal took a bit more than 1 hour and 2 000 HM to clean all rats. Thanks to Drake speed I was able to deal with all of the groups separately as other groups didn't aggroed when attacking one of them. guys u really think someone give a fck about ur t2 or faction 5 bill ISK fitting ? just keep it simple, and only with important data! Drones get aggroed as soon as they leave the drone bay now, I could pick groups 1, 2 and 3 separately, with no linked aggro between them, but groups 4 and 5 are still linked. Attacking group 2 did not aggro group 3 for me after I killed group 1. Atacking group 4 however did aggro group 5. Best resist to fit is EM but I'd recommend to take out the Centus Slave Lords as primary because they hit thermal hard. 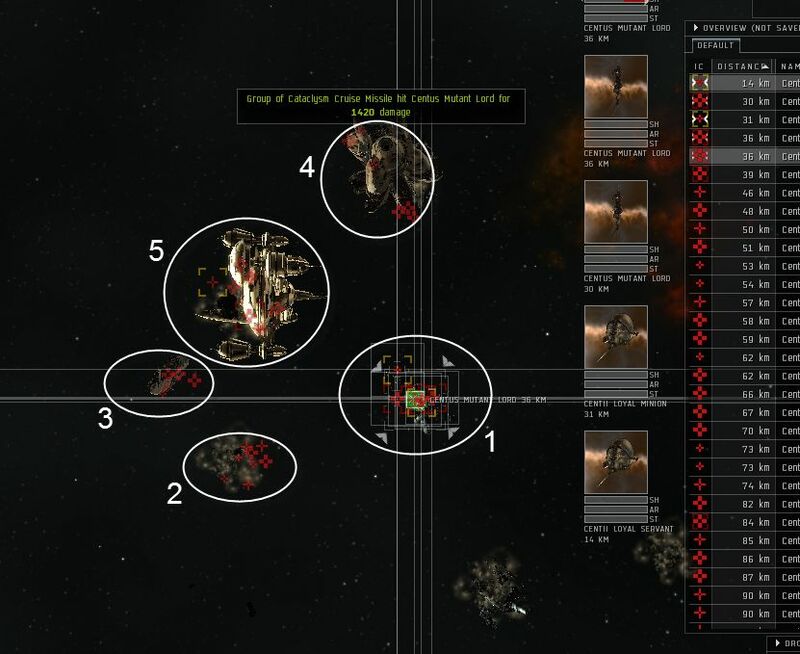 Interestingly, some of the cruisers did not aggro back after having aggroed drones, even when attacking them again. Thank $DIETY for this site. Arrived in my Drake and stopped still. Only Group 1 gave me agression and I moved away from every other group and took out that group. Then it was a case of working out which group was next, recharged missiles and going in picking off each group one by one. - on arrival stop still and then fight whatever has given you agression. - Then pick off any group, one by one. - Bring missiles, lots of missiles. The loot drop isn't great but the bounty isn't bad. There is NO Kinetic Missiles (300hp/s?) and NO such high Therm dmg (343hp/s?). I've rechecked the database and fixed it. Auto-aggroed group 1 on warp in. Killed it. Attacked group 4 at Amarr Trade Station Ruins, no other groups aggroed. Warped in, aggro from Group 1. Popped it, started shooting Group 2. No aggro from other groups. Finished 2 and started on 3, then popped 4. No other groups aggro'd. Obviously, 5 was the last group (and 90km away) and I just picked them off one by one. Let the salvager worry about how far away the wrecks are.